Riverstone Rise is located in sunny Queensland between Gladstone and Tannum Sands, just 17km from Gladstone CBD, 7km to the Tannum Sands beach, and only 14km from Lake Awoonga. Everywhere you look in Riverstone Rise you'll see beautiful green open spaces - there will be parks for relaxing, sports ovals for playing and winding hike and bike trails for stretching your legs. With a focus on family living, Riverstone Rise will offer a healthy outdoor lifestyle where it is easy to keep active. Everything is at your fingertips, discover more about Life at Riverstone Rise here. 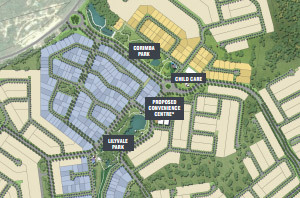 Homesites - Approximately 2,900 residential dwellings, proposed school, childcare centres, community facilities & retail precincts upon completion. Site Character - Undulating site, with the Boyne River running along the east of the community. The site is bordered by Boyne Island Road, Pioneer Drive and the Gladstone Benaraby Road. Product - Once complete, Riverstone Rise will provide a wide range of land, and house and land product delivering predominately detached dwellings, with some duplex homes and terrace homes around the town centre. 17 kilometres to the Gladstone City Centre. 7 kilometres to Tannum Sands. 5 schools within 8 kilometres. 2 shopping centres within 5 kilometres. Boyne Island Tannum Country Club just 2 kilometres away. 6 kilometres to the Bruce Highway. 4.2km of Boyne River Frontage.